Compete against each other on a set of plans & specifications. Typically have little or no formal involvement in the design phase although at times the owner's team may engage specialty contractors for advice, review and initial pricing. Over the last 20 years, many of our owner-customers with complex MEP projects have recognized the value of alternative advanced delivery methods. The advanced delivery methods in the context of MEP systems are: Design/Assist, Design/Build and Integrated Project Delivery (IPD). Today, these streamlined project approaches earn more than 60% of our revenue. Design/Assist (D/A). 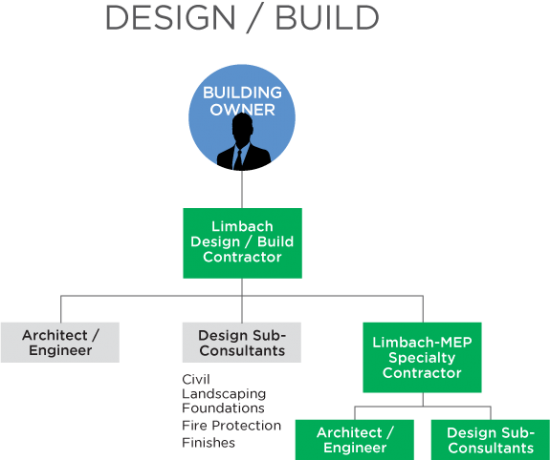 In Design/Assist an owner or CM/GC selects us at the start of or at some point during the design phase, also known as pre-construction. During pre-construction, we are compensated to provide design, cost, schedule and logistical planning services to help maintain the established budget and complete design and drawings on time. Design/Assist usually implies that we will negotiate a Guaranteed Maximum Price (GMP) agreement at an agreed-upon milestone which occurs sometime during or at completion of design. The GMP includes a fixed fee (for overhead & profit), contingencies, general conditions and cost of work. A Design/Assist agreement may alternatively culminate in a negotiated lump sum price. Design/Assist contractors are usually selected in a competitive, structured, Best-Value process that includes a request for proposal (RFP) and interview. Our proposal usually includes an initial conceptual estimate of the cost of work, fees and general conditions, resumes of team members, experience summaries and detail technical approach information. Once we are selected, there is usually no further competition. On rare occasions, an owner may choose to negotiate a cost plus a fee arrangement (without a GMP) due to the nature of the schedule or risks involved with the opportunity. Integrated Project Delivery (IPD). 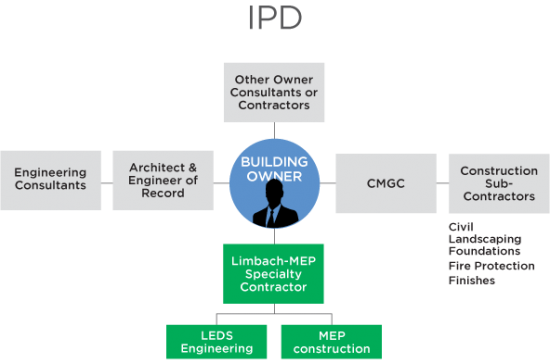 With IPD, all key players on the owner’s team (architect, consulting engineer, certain specialty contractors) are selected prior to the start of project definition and design. During project definition, the team jointly develops the scope, budget, and execution plan for the project. During design, the contractors provide pre-construction services to the team as described above under Design/Assist. Key contractors are usually selected using a structured, Qualification-Based Selection (QBS) process involving an RFP and interview; however, fees, general conditions and cost of work elements are not usually required. Once the contractors are selected, the entire team works together to achieve the owner’s program/design/business objectives within the construction budget. Key team members typically work at-cost during the entire project, meaning that all labor, expense and overhead is reimbursed monthly. Profit is separated from each team member’s direct costs and shared at project close-out based upon an agreed-upon scorecard. IPD is a highly desired and valued delivery method because there’s limited competition during the selection and only elite contractors will be invited to participate. Further, gross margins are usually better than any of the other delivery methods and risk of execution is substantially lower. Owners often prefer IPD for highly complex institutional projects such as hospitals because success relies on team alignment and collaboration at the highest levels. Design/Build (D/B). In Design/Build an owner or CM/GC engages us for both design and construction under a single contract agreement. 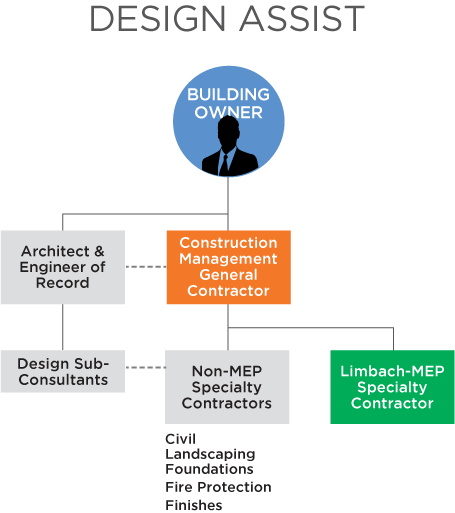 For MEP-intensive projects, we may be the prime contracting entity with the owner, or we may be engaged by a CM/GC or Design/Build prime contractor. With Design/Build, the owner may desire either a competitive lump sum bid, e.g. Plan & Spec Design/Build, or Design/Assist GMP arrangement. 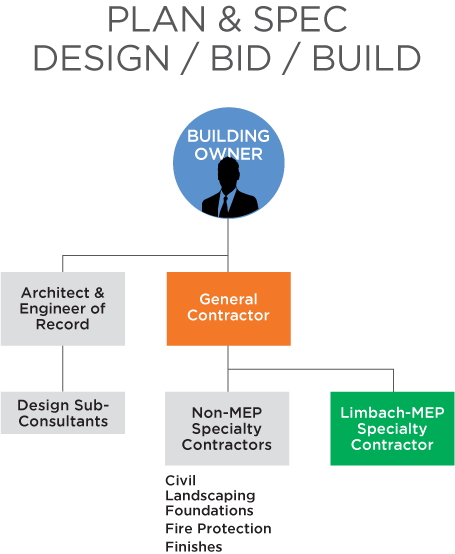 With Plan & Spec Design/Build, the owner prepares a design/bid package (sometimes called a Bridging Document) with sufficient information for the Design/Build contractor to compete for and offer a competitive proposal or bid. With Design/Build GMP, we follow a similar process as described under Design/Assist, except that we self-perform the design work using Harper engineering resources. Owners often prefer D/B because there's less owner design liability and the owner has a single point of accountability for the project outcome. Plan & Spec has two subsets: Price-Only and Best-Value. Price-Only means that the only criteria for selection is price. Best-Value means that price is one of many criteria for selection. Other criteria may include people & their experience, execution plan/schedule, track record/references, workload and price. Today, owners who deploy Plan & Spec/Best-Value often give non-price factors more weight than price. For one of our owner-customers, price is weighted at 25% with all other factors totaling 75%. These numbers tell us that we must be competitive, but the owner is more interested in value delivered through factors beyond price. The competitive landscape and whether we have a unique solution or value proposition that gives us a competitive advantage. Quality of design plans & specifications. Availability of Harper resources to prepare a competitive proposal and execute field construction. Profile and behavior of the owner and owner's team. We undertake the same rubric with advanced delivery methods; however, with early, active engagement of Harper in Project Definition and Pre-Construction, risks reduce and probability of success increases through collaboration and team alignment. Although Plan & Spec delivery implies little or no direct involvement during design, we can still contribute solutions that may save the building owner's team time and money or improve the design or execution of construction.